Casa Ambrose Casa Ambrose was designed and built by Alan Wilkerson in the traditional colonial style for the best indoor/outdoor living. 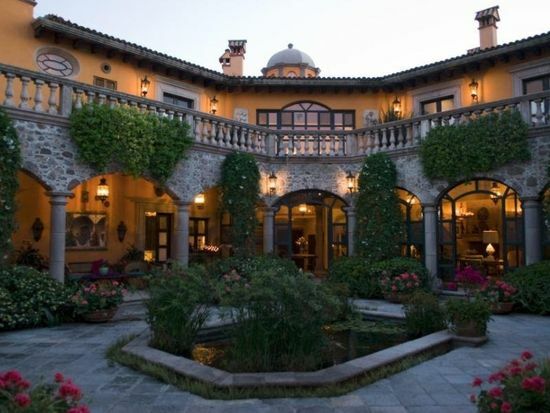 The home, which features a central patio surrounded by hand-carved cantera columns, incorporates antique cantera door frames, crosses and sculptures taken from old hacienda ruins. Casa Ambrose was completed in 1997 after two years of construction. Indoor areas. Five Bodrooms; masterd with in-suite dining area on the main level. Five Baths and two half-baths Habndicap-accesible guest suite with private sitting room on main level. Extra-wide living room flanked by an indoor/outdoor passageway. Upstairs bedroom with dramatic picture-window views of the Parroquia Nine fireplaces, all fitted with ventless gas logs as well as dampers. Half bar Study with red cedar floor-to-ceiling book shelves. Large service area with washer/dryer and full staff bath. Two car garage. Ample storage. Details Four boveda ceilings Custom Carpentry and shelving throughout the house. Antique doors Antique sculptures and details set into walls throughout house. Whole-hose surge protector Brass switchplates Tzalam hardwood floors in Living Room, Master, Guest Suite and Dining Room Onyx hanging lamp in Living Room; Spanish chandelier in dining room Antique brass lamps with beveled glass in passageways. Unique chandeliers in each room Marble floors and countertops in Master bath and downstairs bath. Adoquin flooring downstairs and Saltillo tile floor upstairs. Queretaro marble kitchen countertops.